The Facts on File Dictionary of Clichés omits “going forward, Day One, iconic, that said, off the table, in the run-up to and ahead of (for “before”), right quick, quite frankly, déjà vu all over again, rock star, guys (aimed at groups that include all sexes), dude, hottie, and take it to the next level,” Marie Shear says in a review in the Freelancer, the newsletter for the Editorial Freelancers Association www.the-efa.org. I’m with Shear and would add to her list transparency, a word regularly misused by the New York Times. (Are the workings of any organization ever transparent?) But I agree with Patricia T. O’Conner, who says in her excellent grammar book Woe Is I that we shouldn’t “summarily execute” all clichés and familiar phrases: “Let your ear be your guide. If a phrase sounds expressive and lively and nothing else will do, fine. If it sounds flat, be merciless. 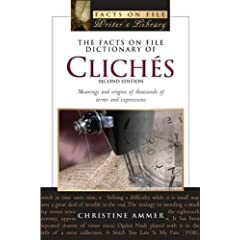 The Facts on File Dictionary of Clichés: Meanings and Origins of Thousands of Terms and Expressions, 2d edition. By Christine Ammer. Facts on File, 534 pp., $19.95, paperback www.factsonfile.com. Update, Nov. 2010: Cyber Hymnal is now NetHymnal, and the links in this post have been changed to reflect it. Today I was looking for facts to add to a quote of the day about a Thanksgiving hymn and found a site called NetHymnal that lets you listen for free to the music of more than hymns and Gospel songs. NetHymnal also has the words and background of tunes, pictures of authors or composers, a few musical scores and more. It offers 29 hymns by J. S. Bach alone, including such chart-busters as “Jesu, Joy of Man’s Desiring” and “Von Himmel Hoch.” The site is just what its name implies — the online equivalent of a hymnal you might find slotted into a pew except that it lets you listen to the music instead of reading the scores. And you can download for free anything that’s out of copyright. The picture above from the old Cyber Hymnal shows Catherine Winkworth (1827-78), who translated “Now Thank We All Our God” (“Nun Danket”) from the German. Are you always looking for the perfect quote for someone’s 37th or 45th or 63rd birthday? Check out The Oxford Book of Ages (Oxford University Press, 224 pp., varied prices), a collection of quotations by well-known people for every year from zero (for newborns) to 100. A year typically has at least a half dozen entries, all chosen Anthony and Sally Sampson. Not all of the quotations express the kind of uplifting sentiments you might want to inscribe on a card – some are downbeat, if not grim – but all are pithy and intelligent. And the best lines are worth quoting again and again. Do you have what it takes to write the “Hallelujah” chorus? There, now don’t you feel better?